AMMEX - GWON48100-BX - Nitrile Gloves - Gloveworks - Heavy Duty, Disposable, Powder Free, Latex Rubber Free, 8 mil, XLarge, Orange (Box of 100) by Ammex at My Athenas. MPN: GWON48100-BX. Hurry! Limited time offer. Offer valid only while supplies last. Gloveworks Heavy Duty Orange Nitrile Glove are best used in heavy duty applications and for any job where high visibility colors are needed. Gloveworks Heavy Duty Orange Nitrile Glove are best used in heavy duty applications and for any job where high visibility colors are needed. 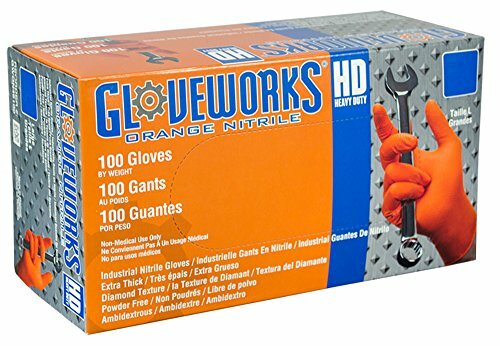 Gloveworks Heavy Duty Orange Nitrile Gloves have the dexterity of a 7 mil glove, but due to the enhanced texture, has the durability of a 10 mil glove. The perfect balance of better dexterity and better protection. Gloveworks Heavy Duty Orange Nitrile Gloves feature a true raised diamond texture for incredible grip. The bold, high visibility orange color really stands out against background surfaces and enhances safety. This glove features excellent chemical resistance from common chemicals, like pesticides and many other specialty chemicals, such as iodine, brake fluid or butane. It is also powder free for working with sticky adhesives or wet paint so that no residue from your gloves can get in the way of a perfect finish. The inside of the glove features a polymer coating, which makes it easy to don or remove when you need a fresh pair. Gloveworks Heavy Duty Orange Nitrile Gloves are commonly used for automotive, manufacturing, janitorial, paint shops, heavy duty and industrial applications. Disposable and limited-use gloves are used in medical, forensic, scientific, food service and industrial applications. Disposable gloves are commonly made from flexible materials such as latex, nitrile, chloroprene and vinyl. While most disposable gloves are designed for use on either hand, some can be purchased in hand-specific models. They are offered powdered or powder-free; silicone or silicone-free; chlorinated or non-chlorinated; coated or uncoated; with a standard- or extended-length cuff; sterile or non-sterile; and with textured or smooth fingers, fingertips and palms. Chemical resistance means the glove helps protect the hand from certain chemicals and varies by glove material. For information on the chemical resistance of this glove, consult the Ammex chemical resistance guide. Ammex distributes medical and industrial products such as gloves, first aid supplies, face masks and other protective coverings. The company, founded in 1988, is headquartered in Kent, WA.